But some people tend to stick with either white or red; sweet or dry; and bubbly or flat. But aside from personal preference, people may gravitate towards a certain type of wine if others give them problems. For many, sweet wines cause some brutal hangovers; others might experience a fast heart rate and flushed skin when drinking red wine. We’re here to talk about about ‘tannins’ in wine, going over what exactly they are, as well as how they affect the taste of your wine and the potential side-effects that some people experience with wines, heavy in tannins. If you’re a wine drinker, you’ve likely heard of ’Tannins’ before. In wine, ‘Tannin' is a textural element that makes wine taste dry. *While knowing what this term means is not a necessity for enjoying a glass of wine! It can help you better understand the wine you’re drinking and even why some wines may give you a headache. Tannin is a naturally occurring polyphenol found in plants, seeds, bark, wood, leaves, and fruit skins. (*For example, about 50% of the dry weight of plant leaves are tannin!). As a characteristic of wine, tannin adds both bitterness and astringency, as well as complexity. Wine tannins are most commonly found in red wine, although some white wines have tannin too, from aging in wooden barrels or fermenting on skins. *Helpful tip: If you want to try a trick that can help you recognize a tannin when you taste it, brew a cup of extra strong black tea. Tannins naturally occur in black tea and their characteristics emerge when the tea is brewed a few minutes longer than recommended. After brewing the tea, take a sip and you’ll immediately notice a slight bitterness in the middle of your tongue and a dryness in the front of your mouth — this is a tannin. Tannins in wine come from two possible places: wine grapes and wood. -- What Are Grape Tannins? Grape tannin comes from the skins, seeds, and stems of a wine grape. For this reason, red wines tend to have higher tannins than white wines because the extended contact of the grapes skins with the juice give the tannins time to dissolve in the alcohol and water in the wine. Some types of wine have higher tannins than others. For example, 'Tannat' is an uncommon red wine with some of the highest levels of tannin. -- What are Wood Tannins? Wood tannins dissolve into wine through contact. Most commonly this happens when wine is stored in wooden barrels. Oak barrels are the most popular choice because of the flavors they add to wine such as vanillin. Tannin powders, oak chips and oak staves are growing in popularity because they are more affordable. It is hard to say which is better, since an oak barrel can be used in winemaking for up to 70 years. Come in to our painting and wine classes for a fantastic time! Like our name implies, we’re a painting studio that serves a little ‘liquid courage’ with our step-by-step instructions. We have a wide variety of wines to choose from, so there’s something for everyone; we also have a great beer selection for the non-wine drinkers! Be sure to view our calendar, consistently, as we're always adding new classes to it! The season of some of our most popular paintings is officially here, starting with the Halloween-Themed artwork, into Fall/Thanksgiving-inspired and soon-come, Christmas/winter theme paintings!! !View our entire calendar on the link at the bottom of the page to see what’s coming up, and remember to tell all of your friends and family about it, as making art and drinking wine is ALWAYS more fun with loves ones by your side! We hope you gained some new knowledge about wine and the tannins that make up some varieties! Perhaps you now know more about why certain wines taste a specific way or why they make your head hurt sometimes. 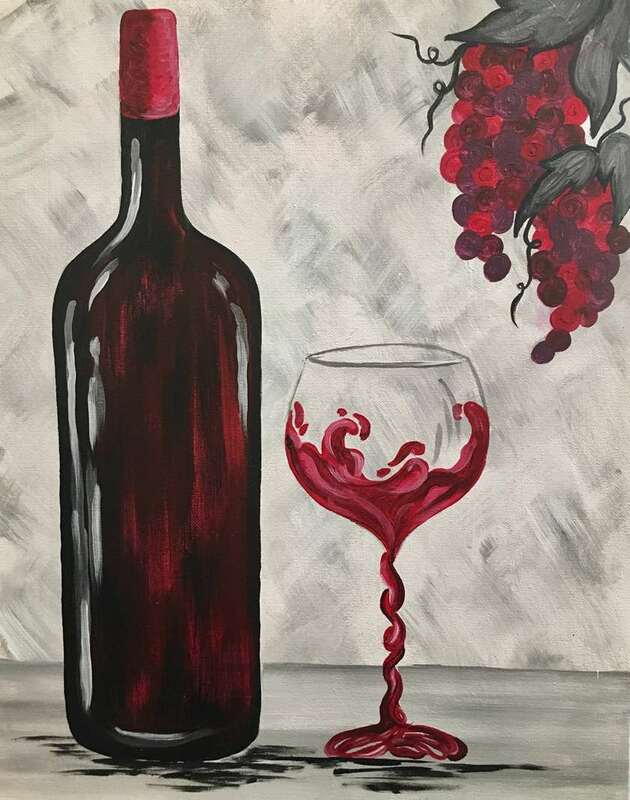 Come in and enjoy some wine as you paint, drink, and have a whole lot of fun at Pinot’s Palette in Downtown Naperville! We hope to see you all, soon, whether you’re a returning customer or first-timer. Check out our website for more information and to sign up for a class! It’s always fun to get in touch with your inner-artist while having fun with friends and family. You’ll sip wine, listen to music, and paint along with our friendly instructor as you create a masterpiece, you’ll treasure forever! We make the perfect spot for a fun girls’ night out, a great date night idea, or even a unique way to have a private, corporate event! You can attend on of our standard, public classes, by viewing the schedule online then signing up for the one you like best! For our private events like birthday parties, bridal showers, or work/corporate events, check out the link below for more information and to get the ball rolling on booking your event! Share View our calendar here!